Home > Law Books > Practice Materials > The Illustrated Guide to Criminal Law, 2018 ed. The Illustrated Guide to Criminal Law, 2018 ed. 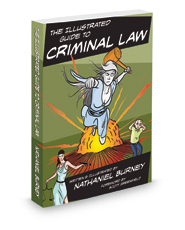 Based on his popular Illustrated Guide to Criminal Law webcomic series, Nathaniel Burney, a New York criminal defense attorney and former prosecutor in the famed Manhattan Rackets Bureau, debunks all of those myths and teaches everything you never learned about the law. Not just what the law is, but why it's like that and how it works. Collected here in the first printed volume, The Illustrated Guide to Criminal Law is a complete law school course that keeps the “laughter” in “manslaughter.” As you read, you start from the absolute basics (“What is crime?”) and soon dive deep into more complex concepts, including conspiracy, self-defense, and, yes, entrapment – all explained with humor, wit, and passion.